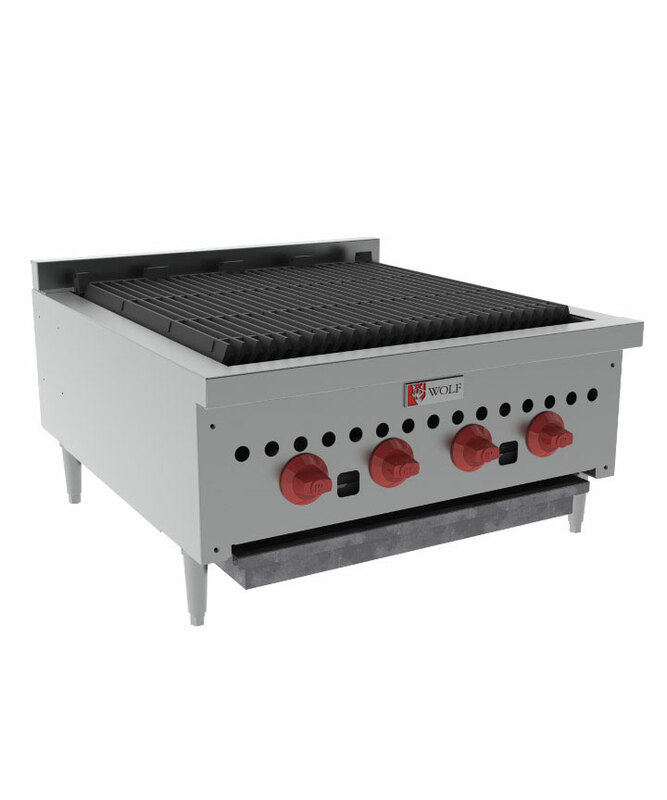 Wolf Super Charbroiler Design features finned cast alloy radiant that produce infrared rays to seal in the juices, Steaks, chops, hamburgers and seafoods have a delicious, charbroiled flavor! Other features include: Flame-Arrestor greates with cast-in pitched grease trough on each blade, Standard pilots, individually controlled direct action burners and a heat deflector under each burner, which creates a "cool zone" in the grease drawer. These SCB models are 27" deep in five widths 25", 36", 47", 60" and 72"
Stainless steel sides, control panel, top rim backsplash and grease trough. Full width front grease drawer. 5-1/4" wide grates are reversible for "level" broiling or self cleaning. Cast-in pitched grease trough in east grate blade provides far run-off and controls flare-ups. One 14,500 BTU/Hr burner for each broiling grate.